There truly is no doubting that Oppo’s recent investments and promises had cleaved the HiFi world in twain. Not long ago, they released the HA-1 DAC and Amp combo, which by rights was an incredible machine, as well as something I personally loved to pieces. Now, Oppo has opted into the 4K disk player market…but Oppo is Oppo. A mere blu-ray/4K UHD disk player just wasn’t enough. Nope. They had to go in and drop in an excellent, modern ES9038 PRO DAC chips in there…along with a slew of other amazing features and extras for sound qualities…on a video player. A VIDEO player. Are you hearing me?! Team Oppo made sure to construct the UDP-205 with double layered brushed aluminum metal chassis, which was intentionally done, as is, to reduce the likelihood of exterior vibration flowing into the unit itself. No dial on this one, just some solid buttons, and a nice VFD (Vacuum Fluorescent Display) front panel. The 205 also has very beefy, solid and weighty foundation. All of the connection and adapter points are excellent and I feel no jiggle or looseness at all, which is a common problem with Blu-ray players in general. If you aren’t a videophile and have little experience with movie players, you should know that it is costly to acquire a Blu-ray player with some nice RCA outputs that won’t break easily. I’d expect no less from Oppo at this point, so high marks all around for build and overall design. Sure, she is large, but make no mistake…she is in charge. There is just too much going on with this product to begin to hope to keep a review down to a readable size. I could easily write a 10-page report on just the specs alone and why they are awesome. The UDP-205’s laundry list of features is absurd (in a positive manner) and isn’t to be trifled with. Respect it! Oppo certainly earns their colors on what this baby can actually do for you. So, I have no choice but to be as to the point I can in this area, then I can move to raw sound quality. Videophiles who are also Audiophiles have been stuck with Digital audio output for some time. I am sure most of us have purchased Fiio’s D3 or a similar Digital to RCA output device for use with our Blu-ray players. We do as such because we likely don’t have, nor desire to buy, a digital input amplifier and prefer to stay analog. Color me into that margin, I’m certainly one of those types. Blu-ray movie goers should be rejoicing and singing in the streets right now, because the 205 has included balanced XLR, RCA, and standard ¼ output options. This is all on just one unit…that is a 4K UHD disk player as well. Audiophiles don’t understand the significance of this. So let me reiterate again: the UDP-205 is the only Blu-ray player that also offers 4K, as well as a great USB DAC Chip…and a fantastic lineup of purely analog outputs. I am able to hook up my powered balanced JBL XLR speakers directly to the 205 and never have to worry about anything. If I want headphones, I plug them into to the front side of the 205 and that disables the rear output. 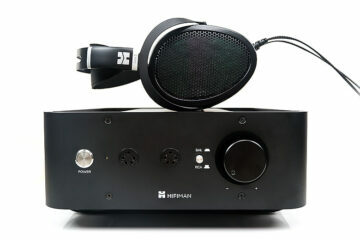 If I am using an HE-6 from Hifiman, or another headphone that requires a powerful or electrostatic amp, then I can opt to unplug the XLRs and route them to the dedicated amp or unplug my speakers from the XLR and swap in on the RCA outputs. This is automatically handled while in USB DAC mode, as well as Blu-ray disk/UHD disk mode. It does this very easily. Meaning: I can swap freely and easily between outputs and not cause issues. You have no clue how happy this makes me. No, the 205 isn’t a speaker amp, so you’ll require powered speakers of course. That is not an issue if you have great powered speakers already. It isn’t a super powerful amplifier and intended to be paired with something else beefier, as the USD-205 rates at just under 0.6W into 32ohm. This is underwhelming, but again, this is a Blu-ray player and not intended for usage with very demanding headphones. It doesn’t need a powerful amplifier. 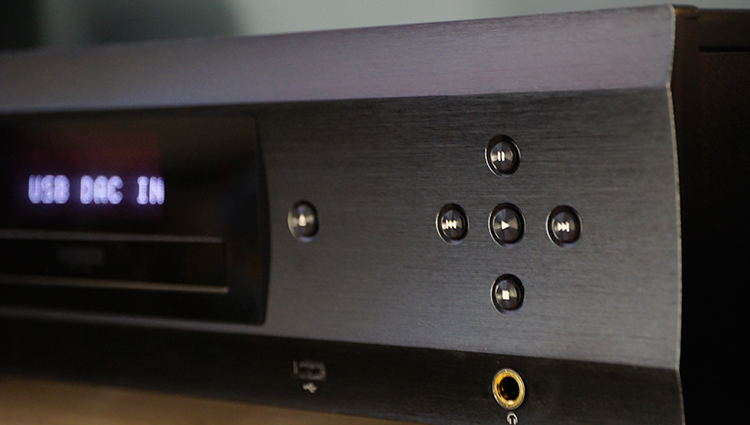 If 4K UHD wasn’t enough for your USB DAC, or if your great USB DAC wasn’t enough for your 4K UHD player…consider that the 205 offers a massive list of file type and input options as well for your purely audio needs. That list includes native decoding DSD 515 at 768Khz via the new ES9038PRO chip used inside. You can now have incredible sound quality in your gaming, amping or home ents experiences. At long last. Also included, a 7.1 surround sound mode, as well as Dolby TrueHD and DTS-HD (Atmos/X) options. 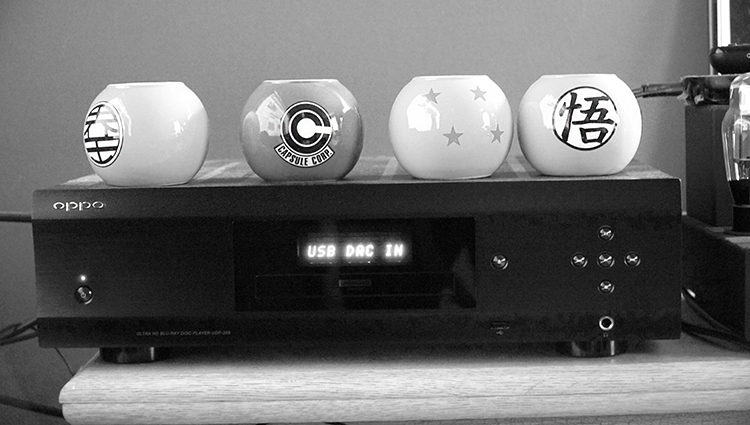 The USB DAC itself is a thing on its own, but to have all of this in your non-PC setup? This is a gift from above and something all audio lovers have dreamed of for ages. This is where I’d be justified in starting the crowd on a slow clap, as the movie end titles start up…and we’ve only just begun to talk about this product. If you’re not into the home PC based storage unit for your music sourcing needs, you are free to use a USB drive of your own via the UDP-205’s three, count em, three USB 3.0 ports (2 rear USB 3.0, 1 front USB 2.0) which handle video playback, as well as photos and music. You can source hard drives easily now at audio meets and not have to use a computer. Meet attendee’s, or event coordinators, pay attention if you are interested in showing off your headphone products and are worried about audiophiles coming your way and asking to use their own gear. Now, you won’t have to worry. Send out a distress call to tote your own Hard Drive and they can now direct plug in with their own headphone or hard drive and not worry about sifting through your playlists on your computer. The WiFi 802.11ac function is something I am not really into at all, and I also don’t see anyone actually using it much, but it is still great to have. 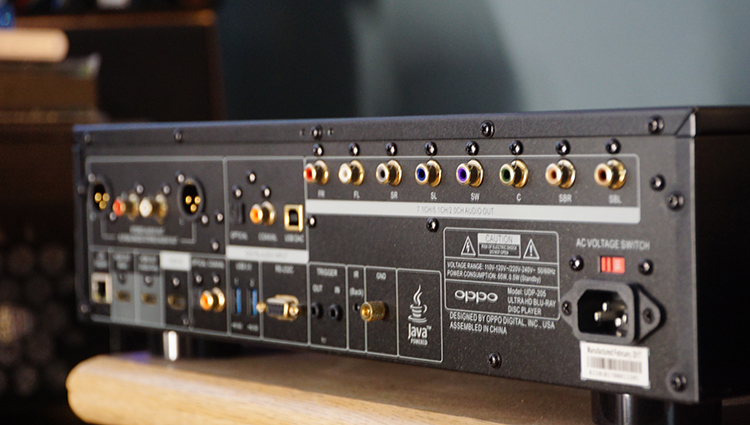 If you have a home network and wish to stream directly to the Oppo UDP-205, feel free. It also has an Ethernet port to run directly via that method as well if you prefer to route from your home servers. I feel like Oppo has certainly covered everything but Bluetooth on the market right now. Sadly, no BT functions on this one. I would have preferred a BT output so I can use the 205 with some BT headphones I received recently. But, maybe I am asking way too much at this point…and you don’t see my complaining much. This is all about Hifi and BT is still low-medium-Fi at the moment. So, maybe it was very wise of them to not include it. This is something we’ve not done at Headfonics, but because this player is also intended for video playback, I do have to at least touch on what I think of it. I have owned 4K tvs for a few years, which included Samsung’s flagship and the Sony X series, as well as LG’s most recent. I decided to stick with the Sony 4K projector series, due to the obvious nature of 150 inches of 4K goodness. I sacrificed HDR for size. So for HDR disk playback, I had to sample back to an LG 4K television. The experience is addictive to say the very least. I purchased a few 4K movies just for this review, which include Mad Max, John Wick and a few other UHD disks at random. I have been absolutely blown to bits by it all…especially on the Kong: Skull Island 4K disk and the recent re-release remaster of The Fifth Element on 4K. Wow, is all I have to say. The 205 is the first UHDplayer to offer true Dolby Vision, where Dolby Vision is available on the disk itself to play. Stunning. Nothing more needs to be said. Nobody will question this as the absolute, world wide, Blu-ray UHD 4K reading standard product. This UDP-205 is literally the top of the food chain. Oppo is King. 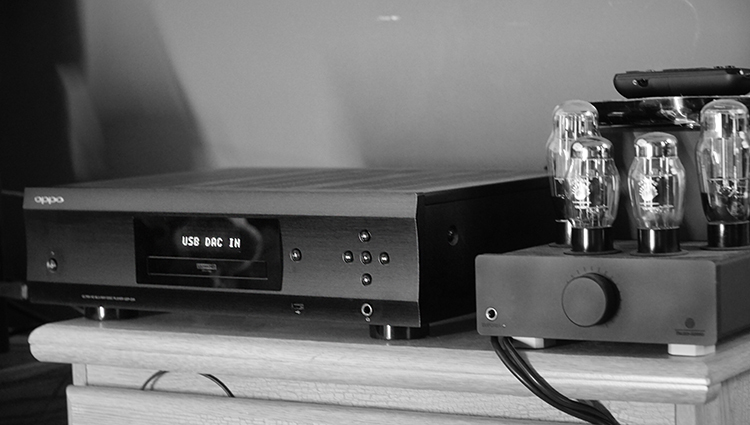 The 9038PRO DAC is actually an improvement on the older 9018 series, at least to a moderately audible degree. I have way too many amps that use the older 9018 to count and almost all of them sound different than this UDP-205’s included 9038PRO. That is a great sign, because the implementation is actually well thought out, rendered and methodically logical in how the sound circuitry actually performs. As usual, Oppo makes it known they source parts for their circuits piece by piece to acquire the desired sound type they are after. This much was vividly clear. Via movie usage, or the PC USB DAC function on a flat EQ, the experience sounds identical to itself in the other modes. I can’t tell it apart, which means the unit is not cycling hidden EQ presets depending on what type of usage you are currently involved with. The 9038Pro is an uncommon beast in the market of today, you don’t really see it. The older 9018 still is in the spot light, despite and at least in my opinion, the 9038 is the superior sounding chip. This goes back to my debate on the Burson 1793 vs the Burson 9018 in their conductor series and implementation between the 9018 of the Burson and the 9018 of the older HA-1 DAC from Oppo sounding different. Parts matter. I found the HA-1 to be more musical on the low end and more reserved on top than the flat neutral 9018 of the Burson 9018 Conductor. Here, I have almost no reference point for the newer 9038Pro used in the UDP-205. I can say that I think it has more of a shared tonality to the HA-1 of old than anything else. So, in other words, the 9038PRO here in front of me with whatever other parts are in there, sounds more like the HA-1’s 9018 circuits than anything else I can think of. This is a good thing. You want a bit of musicality, but not nearly enough to saturate the tone. The UDP-205 proves again it is well thought out. Just a bit of warmth down below to make it a beautiful experience no matter what I am doing with it. Unquestionably, there is just a gentle amount of oomph down yonder, but I find it very inviting and satisfying. On a flat EQ, I can feel the extra bump of quantity over the HA-1 using the same file and EQ preset in Foobar2000. After all, this is meant to be a home theater system and not a Hifi neutral DAC/AMP for purists who demand 100% flatness. This pairs with speakers and most headphones better, and also covers a small amount of very painfully, terribly recorded audio that most films have these days. Most audiophiles know this already, as we’ve found that movie studio’s give hardly any attention to masterful sound editing these days. Some films have terrible sound quality, others are fantastic. The very small amount of boost on the bass end of this unit is enough to make the very bad recordings sound tolerable without relying on distortion caused by EQ functions via a software. I’d rather have just a little stock boost already in the hardware instead, so as to minimize bad, or cheap EQ filters. As for the raw audio quality, it is excellent, pure for the most part and lacking a harsh, dynamic impact. It is moderately impacting, but never blaring or annoyingly wince worthy. Engaging is what I’d call it, which is something we all want more of. In my opinion, the midrange is fully neutral and lacks even a hint of nasal tendency. In terms of neutral tone, I can’t tell it apart from the older HA-1’s 9018. As for raw quality, I can hear the superiority in the UDP-205 by a narrow margin. 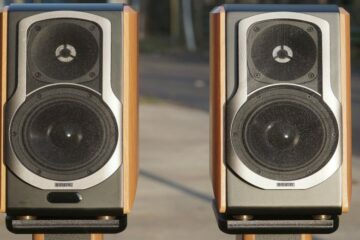 I find all vocals to lack a very forward sense on my very forward sounding speaker setup, and after some more testing on other speakers from JBL and AudioEngine, as well as with a huge array of headphones, I’ve found that the UDP-205’s mid-band looms around a moderately forward level without ever sounding overly in your face. Too close is a bad thing, it takes away from the sound field and vastness of the depth of imaging. Too recessed, and well…I for one dislike V-shaped sound signature. Thankfully, this isn’t at all an issue. It is just as it should be in terms of placement and locale. I could not ask for more. Quality is, of course, excellent. Doing justice as a source with excellent fidelity rendering on the fly for film sources and other lower tier quality tracks. Nothing sounds bad here, ever. If I had a gripe, this would be the area of a low-level complaint. I feel the treble to be overly reserved and very linear with the midrange offered. By that, I mean the treble and midrange do not seem to battle for attention, and due to that, the bassy end feels a little prominent by comparison. Quality is not at all the issue here, as it is very good, it is the physical quantity and bite factor. It is moderate to the upper end of low in terms of physical dynamic impact. This is a great thing for home theaters, I get that most might prefer the top end to be enjoyable and not painful. On a flat EQ, the treble end through music enjoyment is just a bit too underwhelming. Not much. If you have treble prominent or focused headphones or speakers, this will need a little bit of EQ to make it interesting, at least in my opinion. As mentioned, it isn’t a real problem, it is a subjective gripe there and I merely felt the treble to be a little reserved in quantity. Quality is another story, I find it more than pure enough to be paired with very high-end amplifiers and headphones. I can’t at all tell a difference in imaging qualities between the older HA-1’s 9018 and this newer 9038Pro. They feel, at least in a physical sense, the same. Which is still good, as the HA-1 was very nice with imaging. With 2.1 speakers, this isn’t an issue at all, nor it is with most headphones out there. But, the Sennheiser HD800 (known for excellent imaging) probably isn’t best suited here. I’d be opting for a Burson instead. All things imaging are into the very nice tier, with nothing lacking. Height, width, depth, and separation rated well only equates to the entire experience rating very well. I lean back and tip my hat at Oppo for it because they’ve adapted every piece of this machine to sound the way it does and in doing so, the imaging factors lack literally nothing. If I had to rate each imaging variant (HxWxDxS) then they’d all be 7.5/10s and rated identically the same. Imaging is just good, no doubt about it. I hate to say it, but when we get to the larger sound fields, they tend to sound overly stretched out and thin. Thankfully Oppo knows better and didn’t try to make the sound field overly emphasized. 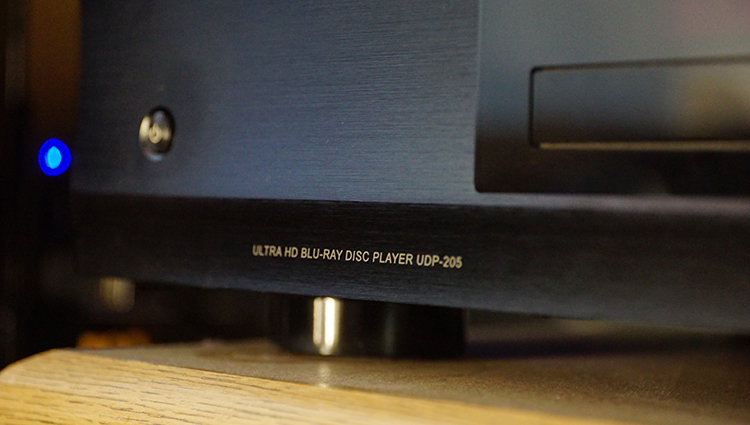 This UDP-205 is the top dog on the block for 4K UHD needs…well, for Blu-ray needs in general. I don’t know of any piece of gear better than this. And that is just for 4K video needs. That aside, the audio functions on this beast are very nice! It is very easy to use and the remote control makes life very easy for me. I love being able to hook directly into a receiver for HDMI needs and then immediately swap to whatever else I want to do, all while retaining excellent sound quality from top to bottom and throughout the experience. This is an end all, be all product for audiophiles with a 4K setup. The only feature it missed was Bluetooth. The price is right. The function and form factor are just gorgeous to boot. Oppo scores another market wrecker status on this product. They are literally at the top of the food chain right now with a real best buy product here that does almost anything you want it to do. From amazing video quality to WiFi functionality and back to excellent sound quality in a modern setup? I can’t ask for more. Great job, Oppo. Input HDMI Audio: up to 7.1ch/192kHz PCM, up to 5.1ch DSD, Bitstream. 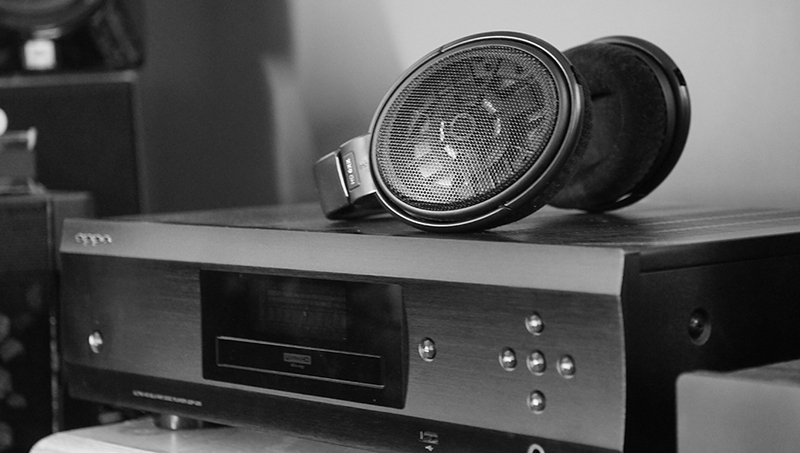 Did you find the headphone output of the 205 to be noisy? Amirm at Audio Science Review measured the headphone output and found the “noise level and distortion remain very high. Probably one of the worst I have measured.” But his measurements may not have been accurate. Your review is excellent and the most detailed I have read to date. I agree with you on the treble and only recently came across this after owning the 205 for 2 months. I have got around it by boosting the treble on my active monitors +2.5db. They are still flat, frequency wise but upon returning to 0 boost its easily heard. I was amazed at this and the lifted treble boost does not add any brightness to the sound as it did in my older setup with Benchmark DAC2L(9018 chip). Certainly in a lot of systems this would not be a problem. The Oppo 205 is running XLR outputs direct to active crossover and Unity Boulder MKI monitors.